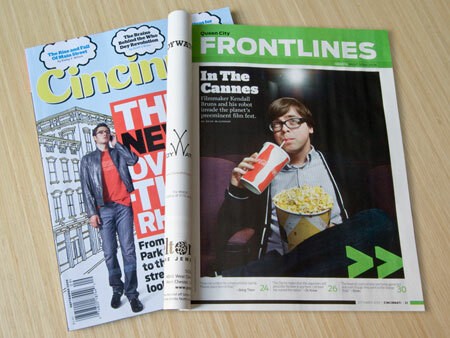 The new issue of Cincinnati Magazine features a nice two-page article about my Cannes experience. It’s the September issue with “The New Over-the-Rhine” cover story, pages 21–22. – I rarely drink Coke and that’s way too much popcorn for one person to eat, so the picture is a little misleading. – I didn’t actually rub Anne Hathaway’s elbows but I guess I might have if I ran into her. I imagine that they are bony and well-moisturized. – The article fails to mention Josh Flowers, who co-directed the short film with me and also co-wrote the story along with the members of OneTwoThree. Josh and I also collaborated on the film that won “Best of Chicago’s 48 Hour Film Project” in 2006. All told, there were 25 people who helped make Robot Love from Another World. – Focus Features is distributing Ang Lee’s new film, Taking Woodstock, and I believe that deal was made before Cannes. I’m not sure exactly what I said to the interviewer but my point was that even major established filmmakers go to the festival with the same sorts of anxiety and fears as the up-and-comers. Some minor quibbles—just setting the record straight. Thanks Cincinnati Magazine! In case you missed it, here are links to the video I made about going to Cannes on YouTube and Vimeo. Posted in Pizza Infinity, PressTagged Cannes, Cincinnati Magazine, Pizza Infinity, Press, Robot LoveBookmark the permalink.